It's finally Friday! Yay! I'm wrapping the week up with abit of hair care, er... hair tools, I guess.Yes, hair tool, specifically a very pretty tuquoise hued curling wand fron NuMe. If you're a girl who curls, you're going to love it. Read on for more details and a bit of hair chat! You'll have to pardon the volumizing powder evident on the heat-proof glove... I didn't think it showed that much. Oops! As you can see, it's already been used and loved. I am not much of a hairdrier (I go au natural with an air dry) and very rarely use a straightener, but my curling wand? It's a must have. 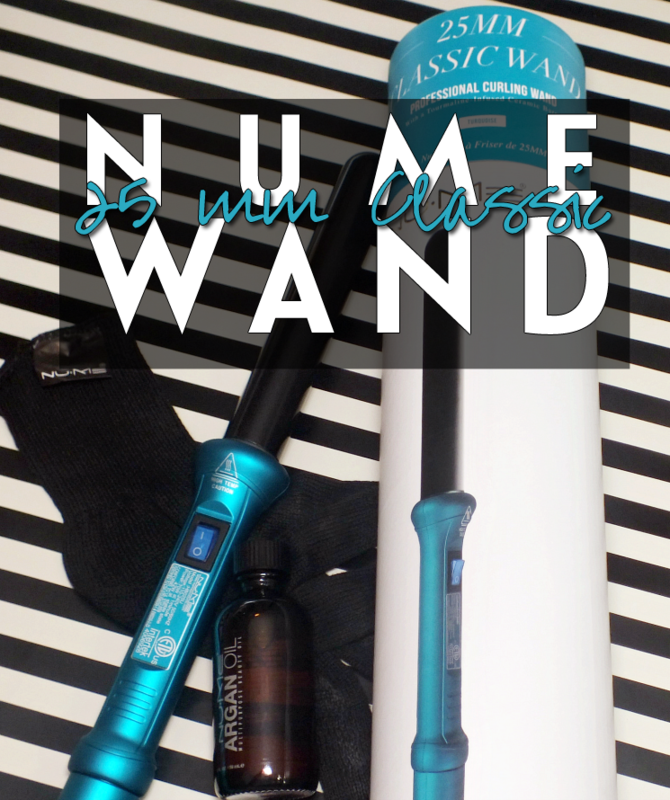 I am a very regular curler, so I was super excited about adding the NuMe 25 mm Classic Curling Wand into my hair tool family. Plus, it's turquoise! I love the colour, but shoudl it not suite your fancy this wand is also available in pink and classic black. 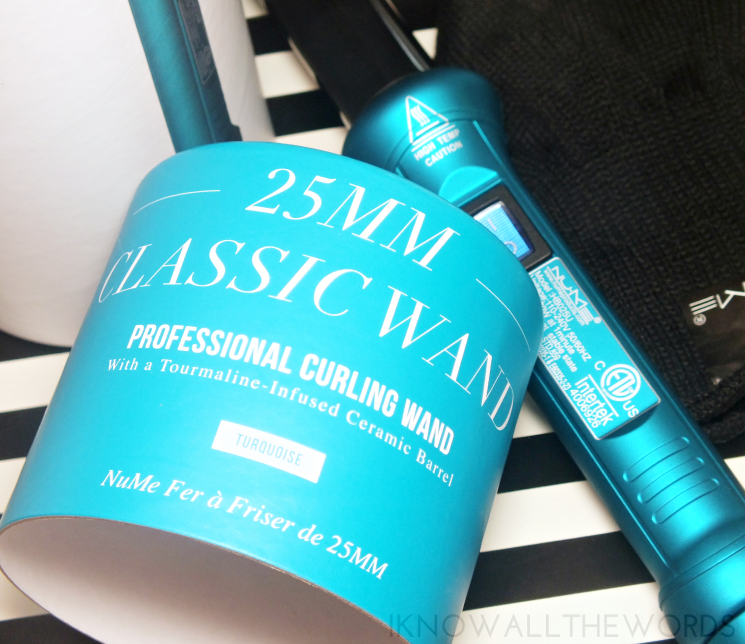 The 25 mm Classic Wand is just that, it's a classic, both in size and features. The wand is incredibly simple to use, as you simply plug it in and turn it on. It heats up really quickly (up to 410 °F) and you're ready to curl. 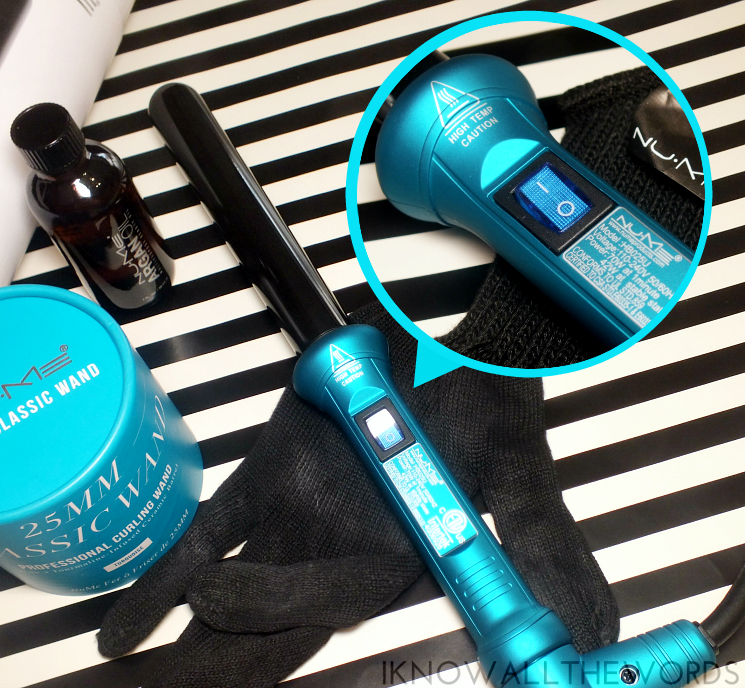 As mentioned, it comes with a heat-proof glove, so you're pretty much safe from any burning accidents (on your hands at least...) The barrel of the wand is coated in tourmaline-infused ceramic that distributes negative ions through hair. Simplified, that means it leaves your hair silky and shiny and glides through hair with ease. The wand size is perfect for medium through to long hair and is able to create full on curls and or waves. I like a voluminous, curly-wavy look, so I curl my whole head, let it set, then brush it out for a less 'done' look. I love that I only have to do my hair once and can get a few days of curls and waves- less work is always a plus. I really love the ease of this curler, but I do find the placement of the on/off switch a bit awkward for me, as I am constantly putting my thumb or finger there an turning off during use. Overall, I'm a fan of NuMe! I'd be lost without my curling wands, and the 25 mm Classic Wand is a nice addition. If you've got shorter hair, they also offer the Classic Wand in 19 mm, 32 mm for longer hair looking for a more wavy effect, and 25 mm reverse and Pearl. 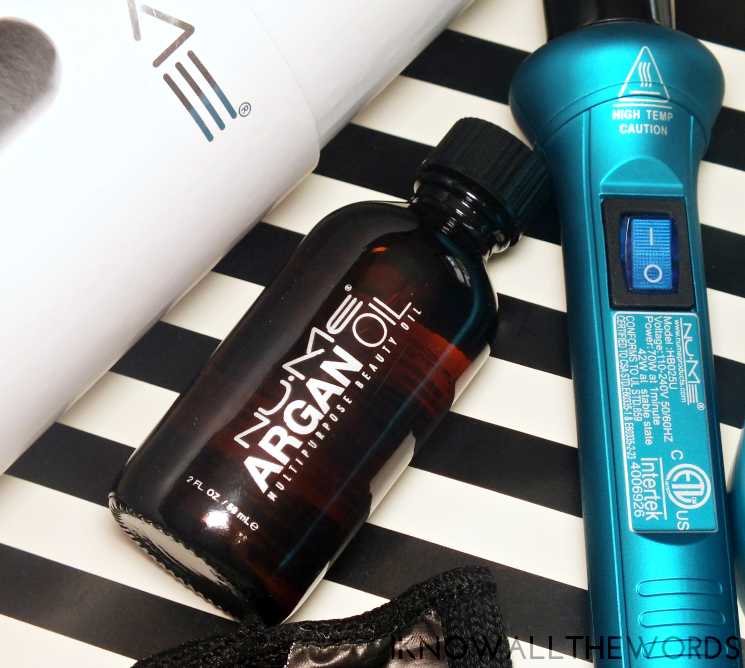 Are you a curling wand fan? Have you tried anything from NuMe?